Proper procedure for medical clearance for client? I am a ACE certified Advanced Health & Fitness Specialist,ACE certified Personal Trainer, and Level2 TRX Trainer with seventeen years of experience in the field of personal training. 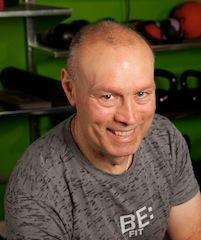 I am self-employed and the owner of ProActive Fitness LLC, a private personal training studio in Beavercreek, Ohio. My focus is on fitness conditioning for golf, preventative and post rehab (post treatment) exercise training for medical conditions and injury recovery, corrective exercise, functional fitness, and the individual undertaking exercise as a new endeavor. My goal is to help you move better, feel better , and perform better. Moving better means less risk of falls and injury, less pain and discomfort, and improvement in performing daily and leisure-time activities. Moving better means improving your muscular strength and endurance,flexibility, coordination, body awareness, balance, stability,and your confidence in your physical abilities...all of which makes you "be strong for life".